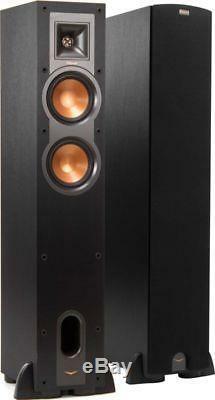 KLIPSCH R-24F Pair Floor standing speakers. The black R-24F Reference Floor-Standing Speaker from Klipsch is a passive speaker designed for use in large rooms. This speaker handles 75W in RMS power, and is equipped with two 4.5 spun-copper injection molded graphite (IMG) woofers. The 90 x 90° Hybrid Tractrix Horn utilizes a circular horn throat paired to a square horn mouth designed to provide high-frequency response and extension, while enhancing imaging and dynamics. The floor-standing speaker also features a linear travel suspension (LTS) tweeter designed to minimize distortion. The spun copper IMG woofers have a rigid, lightweight construction providing low frequency response, with minimal cone breakup and distortion. The Tractrix port allows for efficient air transfer from the cabinet, thus creating a low frequency response. The R-24F has an MDF cabinet with brushed polymer veneer finish. 90 x 90° Hybrid Tractrix horn Linear Travel Suspension (LTS) tweeters Spun copper IMG (Injection Molded Graphite) woofer Front-firing port creates ideal airflow with minimal distortion MDF cabinet with brushed polymer veneer finish Provides the benefits of bi-wiring and bi-amping with sturdy, versatile, and high quality terminals Removable grille. The item "PAIR FLOOR STANDING SPEAKERS KLIPSCH R-24F R24 F BRAND NEW WARRANTY SPECIAL SALE" is in sale since Sunday, July 22, 2018. This item is in the category "Sound & Vision\Home Audio & HiFi Separates\Speakers & Subwoofers". The seller is "hifiexperience" and is located in F - D - GB - I - NL DETAILS IN SHIPPING. This item can be shipped to United Kingdom, Austria, Belgium, Bulgaria, Croatia, Cyprus, Czech republic, Denmark, Estonia, Finland, France, Germany, Greece, Hungary, Ireland, Latvia, Lithuania, Luxembourg, Malta, Netherlands, Poland, Portugal, Romania, Slovakia, Slovenia, Spain, Sweden, Australia, Canada, Brazil, Japan, New Zealand, China, Israel, Hong Kong, Norway, Indonesia, Malaysia, Mexico, Singapore, South Korea, Switzerland, Taiwan, Thailand, Chile, United States.